Back in the 1990s, the present Dalai Lama posed an interesting question to neurosurgeons. He wanted to know if our mind, through meditation, rewires the brain. Meditation was not a well-researched area then and one brain surgeon told him quite bluntly that physical states gave rise to mental states and not vice versa. Essentially saying that it was the brain that created the mind and the opposite couldn't be true. That was then. Today, scientists using modern technology, like fMRI scans, have developed a more thorough understanding of what’s taking place in our brains when we meditate. During meditation, our brains stop processing information as actively as they normally would. There is a marked decrease in beta waves, which indicate processing of information by our brains, even after a single 20-minute meditation session. This holds true even if we have never meditated before. The image above shows the dramatic difference in the beta waves prior to (bright colors on the left) and post meditation (on the right). The most highly evolved part of the brain, responsible for reasoning, planning, emotions, and self-conscious awareness tends to go offline during meditation. Activity in this part slows down considerably, reducing the sensory information processed by the brain. Is the gatekeeper for the senses and decides which sensory data goes deeper into the brain and which doesn't. Meditation reduces the flow of information coming in through the thalamus to a trickle. This is the brain's centre for the fight-or-flight response. Meditation reduces its arousal by filtering the incoming signals. This brain rewiring changes the nature and behavior of synaptic connections between different neurons, reducing their workload by significantly decreasing the information processed by them. Result: a relaxed and calm mind. Meditation weakens the neural connections to the medial prefrontal cortex. In plain speak, a painful sensation or stressful situation no longer causes a panicked reaction as if your very survival is under threat. Rather you will react from the lateral prefrontal cortex, which allows you to look at things from a more rational, logical and balanced perspective. Meditation strengthens the neural pathways to this part of the brain allowing you to modulate your emotional responses by overriding automatic behaviors/habits and decreasing the brain’s tendency to take things personally. People who practice meditation develop the ability to ignore distractions in the environment. This superior ability to focus better helps them to rapidly remember and incorporate new facts. In a recent study done by UCLA School of Medicine, long term meditators had significantly larger gray matter volumes in the orbito-frontal and hippocampal regions, implying a remarkable ability to cultivate positive emotions, retain emotional stability, and engage in mindful behavior in daily activities. The extra gray matter preserves our cognitive functioning as we grow old, saving us from late life diseases like Alzheimer's. According to the Leiden Institute for Brain and Cognition, Leiden University, Netherlands, open monitoring meditation made people perform better on a task that asked them to come up with new ideas. 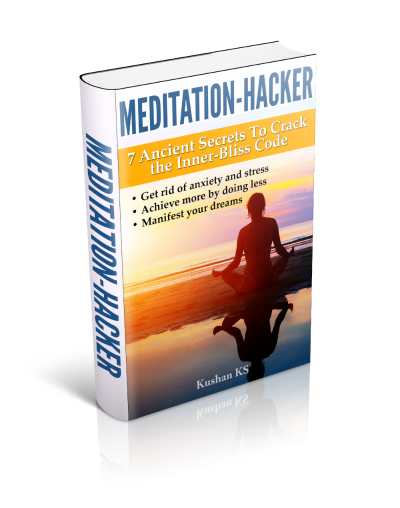 The study said, "Open monitoring meditation facilitates divergent thinking and restructures cognitive processing in a way that is robust and general enough to affect performance in another, logically unrelated task." In 2008 Richard J. Davidson at the University of Wisconsin–Madison published a classic study with the active participation of 8 Buddhist monks and 10 student volunteers. The former were asked to attain a state of “unconditional loving-kindness and compassion” (a form of meditation that does not focus on a single object), whereas the volunteers were asked to think about somebody they deeply cared about and then try to generalize these feelings to all sentient beings. The onset of meditation in the monks coincided with an increase in gamma waves, spanning 25 to 42 oscillations a second, which was synchronized across the frontal and parietal cortices (part of the brain tied to empathy). They experienced more compassion for others when shown disturbing images or heard sounds of people suffering. The gamma waves were found to be 30 times greater in monks than in the novices. And the more years the monks had been practicing meditation, the stronger the gamma waves. 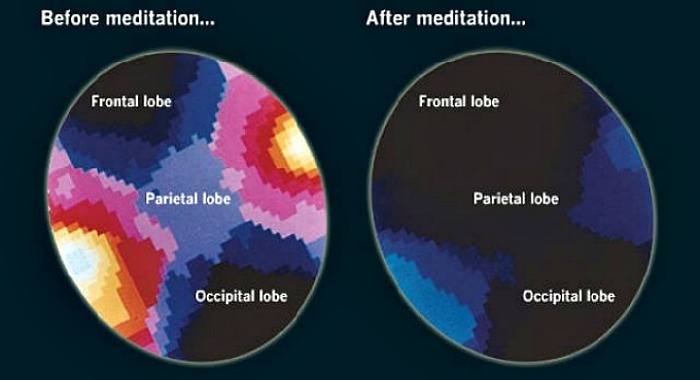 This shows that over time, meditation rewires our brain from the inside out. The gamma waves explain the heightened sense of consciousness, connectedness, bliss, and intellectual acuity experienced subsequent to meditation. Even when the monks were not meditating, but simply quietly resting, their baseline brain activity was distinct from that of the students. Proof, that mind, the so-called interior aspect of the brain, can change the brain that is the exterior aspect of the mind. And the more training they had, the bigger the effect. It is fascinating how meditation rewires our brain and how even little, regular doses of it can change us fundamentally for the good. Science is now showing that we ignore meditation at our own peril. 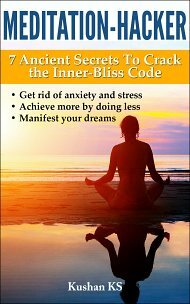 If you don't meditate yet, give the techniques in the Beginners' Guide a try and see for yourself how meditation can benefit you.